Located in the Pacific Ocean, approximately midway between Australia and Hawaii, the Polynesian island of Tuvalu was the home for a most innovative project from Wednesday 30th November to Wednesday 7th December. Supported by Olympic Solidarity and organised under the auspices of the ITTF Development Programme, a Para Training Camp was staged alongside an ITTF Hopes Week. A challenge but it was one that Australia’s Brett Clarke, who assumed the roles of Course Conductor and Head Coach, relished. Overall 39 athletes attended the joint venture, the venue for proceedings being the Nekufetau Community Hall where the equipment provided by the Xiom Development Incentive Programme Donation in 2013 was put to good use. Pertinently, players from other Tuvaluan island communities were welcomed. The high number of players present pays great credit to the efforts of the Tuvalu Table Tennis Association. 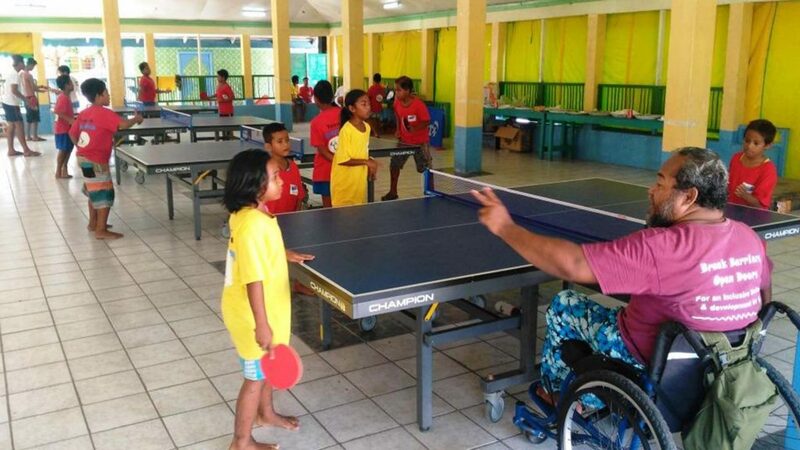 Pertinently, it was the first time a Para Table Tennis Camp had been held in Tuvalu; the aim being to prepare players for forthcoming competitions. Notably, table tennis is on the menu for the 2017 Pacific Mini Games to be staged in December 2017 in Vanuatu. Most certainly motivation and enthusiasm was at a high level; all benefitted from the knowledge of Brett Clarke. Amongst many international appearances, notably he competed in the Sydney 2000 Olympic Games, as well as two years earlier being the Men’s Singles runner up at the Oceania Championships. Intensive training completed, on the final day it was intensive competition. A Hopes Challenge Tournament was conducted; Kalton Melton won the Boys’ Singles event; the counterpart Girls’ Singles title was secured by Tehana Petelu. Fine performances from Kalton Melton and Tehana Petelu; following the Para Table Tennis Camp, it was the same for Ioane Hawaii and Esekia Vaega. Both competed in the New Zealand Para Open staged in Auckland on Saturday 17th and Sunday 18th December, both secured medals in their respective classes.